Richard Grogan made a career of spotting bad ideas. He didn’t suffer them lightly -- at Bain & Company, the strategic management firm where he was a senior partner, the many companies’ boards he sits on, or while director of the U.S. Senate Judiciary Committee. So in 2003, when he was on a ski vacation with his family, he wasn’t especially impressed when two bankers representing a pair of British twin entrepreneurs approached him with a new opportunity. The conversation was brief. “What industry is it?” he asked. The PGA wanted nothing to do with them. Golf equipment companies said no to partnerships. Investors said no. Now Grogan, too. That last point is true. The number of U.S. golf players peaked at 30 million in 2005 and has steadily dropped since. (It’s now at 23.8 million, with a particularly steep drop among young people.) Since 2006, there have been more U.S. golf course closures than openings every year. But the twins persisted. With the right help, they believed, they could create something that turned all those noes into yeses -- that would make the PGA come to them, attract the best sponsors and partners, and turn millions of non-golfers into avid Topgolfers. They’d have a way to go. But eventually, they’d be proven right. That’s the idea that inspired Steve Jolliffe and his brother. It was 1997, and the brothers were golfing while deciding their next step. They’d just sold off their mystery-shopping business -- that is, a firm that companies hire to send people secretly into their stores to evaluate their staff -- and were looking for something new. As they golfed, they began complaining about the game: It’s time-consuming, and the driving ranges used for practice are usually joyless mud fields. They thought about how to make the game better, quicker, and more fun. Microchip technology was becoming commercialized at the time, and they wondered, What would happen if we put a chip inside a golf ball to track the distance and accuracy of a shot? They pried a chip out of a dog collar, put it into a golf ball and then, because the chip was designed for police to help find lost dogs, took it to a local police station to ask the cops to scan the golf ball. It worked. Next question: What does someone do with this ball? It couldn’t be just for regular golfers; that was a too-small idea. “We wanted to create a compelling and addictive game, so when a child hits one into the front target, they’re way more excited than a golfer hitting one into a back target,” Steve says. To accomplish that, they’d need more than flag-marked holes. They’d need targets -- big, bunker-size targets like sprawling dartboards. To build them, they bought a local driving range in Watford, just outside London, and tore it up. Each target went 10 feet deep and 25 yards wide, filled with sensors so a golfer would know exactly how close to the middle their ball landed. (The closer a player got, the more points they’d earn.) Then they replaced the grass with artificial turf, to allow balls to roll more quickly toward the target and make it easy for even non-golfers to score points. The new course opened in 2000. It confused everyone. Often, people showed up thinking they’d be playing in a simulator. “We were literally handing out leaflets at the local train station, putting them through people’s doors and advertising in local papers,” Steve says. “The problem is that you had to explain what it was, and you couldn’t, really.” It was…like golf…but not? This didn’t sit well with golfers. Golf companies like the accessories giant Titleist wanted no part of it. But the Jolliffes were compelled by a few shining points. Revenue was up eightfold compared to its last year in operation as a regular driving range. And more important, 51 percent of shots hit a target. They’d created an accessible game, which they called Topgolf; Top was an acronym for “target-oriented practice.” Now they just needed someone to help translate it for the United States. However, Grogan thought he had the solution. Topgolf, he believed, needed to be an experience -- a place with great food, parties and other ways to make money beyond the game itself. He agreed to buy the U.S. license for Topgolf, then lined up investors and drew up a plan for American expansion. Topgolf facilities would have to be three to four times the size of the original Watford facility, with restaurants, kitchens and event spaces. He picked its first new location: Alexandria, Va., just outside Washington, D.C., an area replete with government workers who do business on golf courses. The facility opened in 2005. That year, Grogan would sit on the top deck of his largely empty facility and hit golf balls by himself. The next year wasn’t much better. Something was wrong. But what? He expanded into Chicago, figuring that the concept would be welcomed in cold, northern climates; instead, snow closed the facility for its first four weeks and damaged its equipment. He also opened a Topgolf in Dallas, figuring the warm climate, strong golf culture (two major tournaments are held in the area) and glut of Fortune 500 companies would welcome the game. But that site, too, sat largely empty. In February 2007, Grogan walked into the Dallas facility and into a management team lined up “like a wedding reception” to greet him. When Grogan finally reached the head manager, he was greeted with a handshake and unearned optimism. “Don’t worry, Rick; we’ll be fine by May,” the manager said. “I’ll be dead by May,” Grogan responded. Grogan reflected on the Jolliffes’ original problem: When the first Topgolf was built in the U.K., people didn’t understand it. Maybe, he reasoned, the same problem was still dogging the company. So he called the Dallas staff into a dining room, spread out paper tablecloths, handed them markers and asked them to figure out how Topgolf could attract people. The solutions were fairly low-tech. Based on the group’s suggestions, employees took to the streets wearing sandwich boards and began passing out leaflets on McKinney Avenue, drawing the ire of the Dallas City Council. “I said, ‘Great, let them arrest me; let’s make a story out of it,’ ” Grogan says. After six months of this, people starting coming. Then telling their friends. Topgolf’s Dallas facility had a three-hour wait to hit balls. Postal codes provided by customers indicated that people from all over the world were playing. They’d go home and tell friends, too, leading to crowds at other locations, like that once-struggling spot in Alexandria. Topgolf’s problem had been a messaging problem. Now that it was solved, the company could take an even harder swing. Topgolf thus far was the result of entrepreneurs thinking a step bigger. The Jolliffes: Driving ranges aren’t for practice -- they’re the seed of a new sport. Grogan: This isn’t just a sport -- it’s an experience. And by 2011, it was time for someone else to think even bigger. That person was Erik Anderson, a former Goldman Sachs VP, who, as head of the innovation-focused WestRiver investment group, was Topgolf’s lead investor. His idea: global branding experience. By this point, the U.S. operation had officially acquired the U.K. operation, making one unified company. Anderson replaced Grogan as executive chairman and began an aggressive expansion. First, he grew their facilities even larger -- adding space for more golfers, replacing their tiny kitchens with full line kitchens with executive chefs and behind-the-scenes server passageways and adding TVs everywhere. His major goal, however, was to expand Topgolf’s reach beyond its driving ranges. (After all, what sport today is contained to its playing field?) In 2013, he rolled out iPhone and Android apps. Digital social media walls were installed in facilities in 2015, letting players post their tagged Topgolf photos to a large screen. The next year, Topgolf acquired the online, multiplayer golf game World Golf Tour, as well as a technology called Protracer that tracks the flight of golf balls, displays its path in video and analyzes every shot. It was renamed Toptracer and is becoming a standard feature at Topgolf: Now players see exactly how their ball flies. But Topgolf still needed a statement piece. Anderson turned to Las Vegas. He acquired eight acres of land near the MGM Grand, just off the Vegas strip, as well as a comarketing agreement with MGM that plastered Topgolf’s name and image all over the city. “That’s how I knew our brand was bigger than our size,” he says. And that, it seemed, was what finally got the golf industry to take notice. The same year the Vegas location opened, Topgolf partnered with the Golf Channel on shows and series. The PGA tour and the LPGA came calling next, using Toptracer technology on golf broadcasts and asking Anderson what they could do to help grow the game. “I was surprised that the PGA and the USGA wouldn’t come and work with us in the early days,” Grogan says, “because I’d say to myself, We’re the only thing growing here; wake up.” But the PGA, the LPGA and the USGA aren’t fools; they read the same statistics Topgolf does. While the National Golf Foundation notes that certain aspects of golf are in decline, what it calls “off-course” golf has been growing steadily since 2014. And Topgolf draws a fresh crowd. Just 14 percent of visitors are age 45 or older. Roughly 51 percent don’t play golf otherwise, but nearly a quarter say they follow the sport now thanks to Topgolf. In this, Anderson sees opportunity: He wants golfers to receive a provisional handicap, the grading system golf uses for its players, by playing at Topgolf. Currently, it’s accessible only on courses. “Why should you play 10 rounds of golf -- a 50-hour commitment with lots of fees -- just to get a handicap?” he says. The leagues should consider their answer wisely. Topgolf has its own youth-development programs, coaching programs, weekly leagues, national tour and a media branch producing content for the Golf Channel, Amazon Prime and in-house screens. It has reality shows based around its chefs, its house bands and even its players. 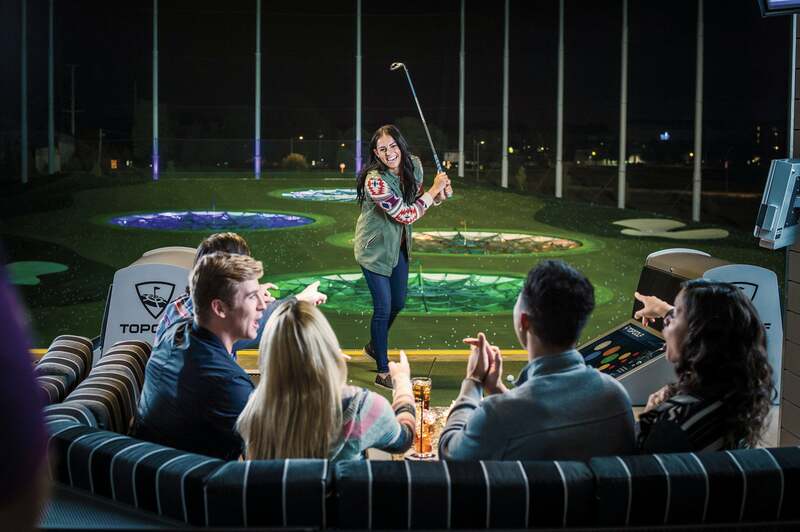 With 60 million people visiting Topgolf in the past seven years and an estimated 16 million coming in each year going forward, Topgolf has come to understand something that traditional golf hasn’t. “Golf in and of itself hadn’t lost appeal to people,” Anderson says, “but it’s how you consume it.” The difference, as its founders first learned more than a decade ago, is in the presentation.